Who Signs a Check Made Out to Two or More People? 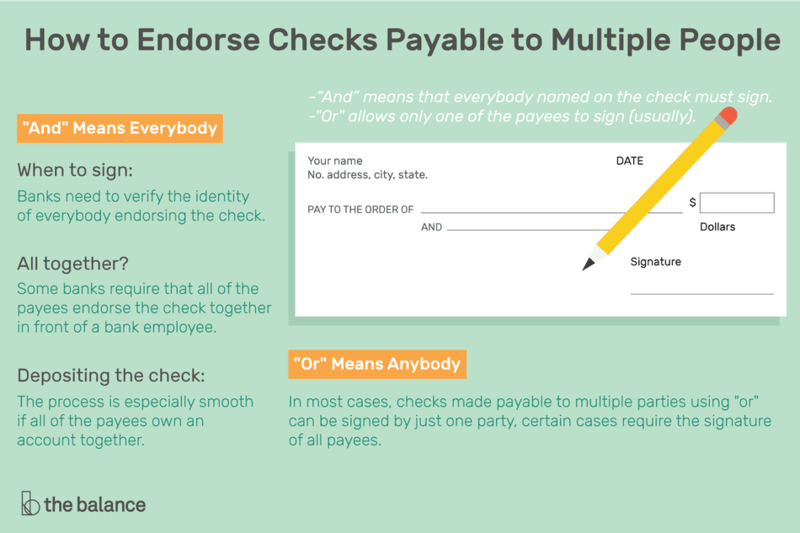 Checks are almost always made payable to a specific person or organization, but sometimes a single check is made out to multiple people. For example, a check might be written to a married couple, several roommates, or any other joint owners of an asset. The wording on those checks is important and will dictate how to handle the check. “And” means that everybody named on the check must sign. "Or" allows only one of the payees to sign (usually). If you've ever studied symbolic logic or computer programming, you're probably already familiar with the concepts. Everybody named on the payee line must sign for checks that use “and.” For example, a check made payable to "John and Jane Doe" should be signed by both John and Jane. When to sign: Banks need to verify the identity of everybody endorsing the check. If a check is payable to two names, and you’re depositing the funds into an account with the same two names, there’s little risk. However, if you want to cash the check, there’s a risk that one person will forge everybody else’s signature and run off with the money. Likewise, banks may have special rules when the names on the check don’t match the names on an account. All together? Some banks require that all of the payees endorse the check together in front of a bank employee. Everybody will need to bring valid identification to prove that they’re allowed to endorse that check. Other banks will accept a check when just one of the payees has an account. As you might imagine, banks are especially careful with high-dollar checks. For a five-dollar check, one person can often endorse and deposit without the hassle of getting everybody together. Depositing the check: If the plan is to deposit the check as opposed to cashing it, the process should be easier. The process is especially smooth if all of the payees own an account together (for example, a joint account for a married couple, and a check written using those same names). It may even be possible for one person to deposit the check without both signatures. In most cases, checks made payable to multiple parties using "or" can be signed by just one party. For example, a check made payable to "John or Jane Doe" can be signed by either John or Jane. However, certain cases require the signature of all payees. If a check is especially large, or it's part of an insurance or legal settlement, talk with your bank and ask an attorney in your state how to proceed. It might be best—or a requirement—to get everybody's signature on the check. What if It’s Not Clear? Some checks do not specify “and” or “or” anywhere. What happens then? The answer is probably not as clear as you’d like. As far as the law is concerned, you can most likely treat the check as if it says “or.” The Uniform Commercial Code (UCC), which generally serves as a template for how states handle these transactions, says that “ambiguous” checks can be negotiated by anybody named on the check. Bank policy overrides: Your bank doesn’t have to follow UCC guidance. Banks can always be more careful if they want to protect themselves from losses. Some banks have a policy that requires everybody to endorse the check when there’s any doubt about the check writer’s intentions. They might even require that everybody be present to sign in front of a bank employee—preventing you from just mailing it in or depositing at an ATM. If you're not sure what to do, you'll have to make some decisions. You can try your luck and simply attempt to deposit or cash a check with just one payee's signature. The risk is that the bank will reject your deposit and require you to get the missing signatures before you re-deposit. That process can take several days or weeks, which means you won't get the money quickly. A safer option is to call the banks involved (the bank that the check is drawn on, and the one where you’ll deposit it) and ask what they require. Don’t be surprised if you get conflicting answers from different people—bank policies aren't always clear or well-known. If possible, talk with somebody who will actually handle the deposit. You can always try: In some cases, checks will be accepted with a single signature—even if the bank’s rules require everybody’s signature—because the missing signatures go unnoticed. Ultimately you’ll have to decide what’s best for you. Weigh the alternatives, considering how easy it is to get everybody’s signature and whether or not you can tolerate delays if the bank comes back and wants more signatures. That said, committing fraud is a bad idea, so don't take money without permission or do anything that you know is wrong. If you're writing a check to more than one person, keep in mind that you can make it relatively easy or difficult for them to deposit the funds. The right choice will depend on what you hope to accomplish, how much you trust the two (or more) people, and other factors like legal and tax issues. “Or” makes it easy: If you just want to make it easy on the recipients and you're not worried about one of them secretly pocketing the funds, using "or" between names allows the most flexibility. “And” keeps everybody informed: If you want more certainty that everybody will be aware of the check, it's better to use "and." This might (or might not) slow things down, but that might be a good thing. One of them might change their name, and it will no longer match the name on the check. You might assume that one of them is changing their name, but that's not accurate. In many cases, newlyweds can deposit these checks even if the names don't match perfectly. Banks see this fairly often, but it might require a trip to the branch (or a few additional documents and phone calls) to deposit those checks. As an alternative, write the check using “or,” or ask how they prefer to receive gifts. How Do You Write Dollars and Cents on a Check?